This is probably not a surprise, since it happens to many big-budget movies, but audience responses from the first night of Man of Steel screenings are leaps and (single) bounds better than the marks the movie has been getting from critics. 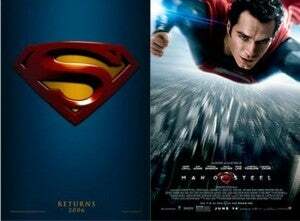 While only 58% of reviewers have given Man of Steel positive reviews, according to the popular review-aggregating site Rotten Tomatoes, 82% of the audience had good things to say, with the average review being 4.2 stars out of five. A 24-percentage-point difference is nothing to sneeze at. That's literally more than the entire positive critical score of Warner Bros.' The Hangover Part III. That's out of more than 81,000 user reviews, so it's hardly a token sampling. For comparison, 477,000 people rated Superman Returns, with 67% of fans rating it higher than 3.5 stars, as compared to 75% of reviewers. What does this mean for the film's box office potential? It's hard to say what (if anything) these kinds of numbers indicate, but it's worth noting that The Hobbit: An Unexpected Journey wasn't "certified fresh" on Rotten Tomatoes, either, rating only a 65% positive rating from critics on its way to a billion-dollar worldwide box office. Among audiences? 84%.